Harvey, Matthea and Giselle Potter Cecil the Pet Glacier. 40 pgs. Schwartz & Wade Books, 2012. $17.99. PICTURE BOOK. All Ruby wants is a normal childhood with normal friends and a normal pet - like a dog. But with her quirky parents tangoing across their front lawn, playing miniature ping pong games on airplanes, and eating their breakfast upside down, a normal life is hard to come by. Instead, Ruby spends countless hours playing with her identical dolls, The Three Jennifers. But on a trip to Norway, Ruby reluctantly ends up with a very strange pet, and it's not the nice, normal dog she wanted. It's a little glacier who follows her around - even to school - and needs to be fed pebbles on a daily basis. Ruby ignores the glacier, wishing he would go away, but when he risks his life in an act of kindness on her behalf, she's forced to reevaluate what she wants in a pet. Like Ruby's parents, this picture book is far from ordinary. 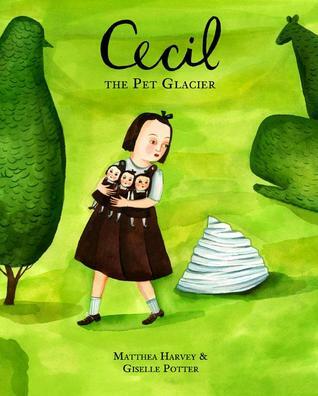 The author and illustrator clearly took great care in adding lots of bizarre little details to round out the characters, from the crocodile shaved in Ruby's topiary-loving dad's beard, to the glacier's refusal to eat gray pebbles. While the details are fun, and the illustrations are vibrant, it is difficult to believe that a girl who has wanted to be normal her entire life would suddenly embrace oddity. Still, it's a fun story with a sweet ending. Note: Despite being a picture book, this is not a quick read as there is a lot of text on each page. EL - ADVISABLE. Reviewed by: Caryn. Amelia has a lot of roles –cheerleader, superhero, friend, and student. But when her Aunt Tanner goes missing, Amelia is panicked. She just knows that she can help. Luckily her best friends are there for her, and they take off by bus to a far-away town to look for her, based on Amelia’s hunch. Does anyone else cringe when they hear about an elementary school aged cheerleader? Ugh! Not to mention the clandestine bus trip out of state! The book started out TOTALLY confusing, especially to a first time reader of this series - all of Amelia’s various ages and ‘roles’ talk together like a group of friends. The art style was a problem for me. I don’t think most people realize that comics are not that popular, its graphic novels that are what students want. This book was like old-fashioned comic book art of newspapers famous Family Circus. Boring. Students know the difference, most are used to top notch action packed graphics and innovative plots –which are often characteristics of graphic novels. On top all of that, I thought the plot and character of Amelia were boring. So not a win if you are trying to incorporate graphic novels. See Zita the Spacegirl for a fantastic new series! ELEMENTARY –NOT RECOMMENDED Reviewer: Stephanie School Librarian & Author. Logan is sure that all the missing dogs in the neighborhood are being kidnapped by aliens. They disappear but their collars and leases stay behind. He gathers a team and together they do research –even using Logan’s own dog as “bait”. After they accused an immigrant from Greece, they end up adding his son to their team. After Logan’s accuses another suspect, things don’t go as expected. I thought this book was poorly written and cheesy. I was rolling my eyes by the second page. The characters are not well developed and the dialogue is stilted and awkward. The cover looks dated and unappealing –which is a big negative in student choice of books. Parts of the plot are really boring, yet are long and drawn out. I don’t think students will take much interest in this book. Rasmussen, Halfdan and Kevin Hawkes. Translated by Marilyn Nelson and Pamela Espeland. A Little Bitty Man and Other Poems for the Very Young. 29 pgs. 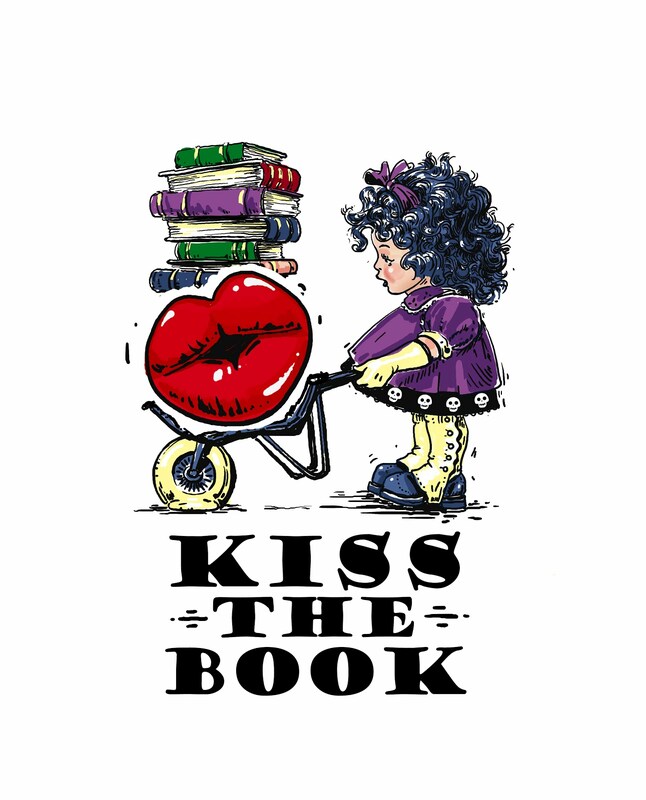 Candlewick Press, 2011. $15.99. PICTURE BOOK. 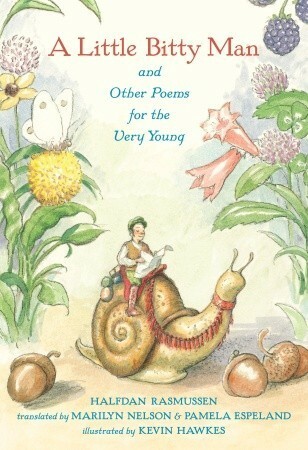 A collection of poems, some humorous (in the vein of Shel Silverstein) and others straight nursery rhymes. Occasional absurd situations and potty humor are designed to earn some giggles. The colorful illustrations nicely complement the content and tone of each poem and may even earn a few chuckles of their own. Pre-K, EL (K-3) - ADVISABLE. Reviewed by: Caryn. Salm, Arthur Anway: A Story about me with 138 footnotes, 27 exaggerations, and 1 plage of spaghetti 192 pgs. Simon & Schuster Books for Young Readers, 2012. $10.87. Max is not excited to go to a family style summer camp. But when he make a split second decision to pretend to be a bolder version of himself –“Mad Max”. He discovers that being cool is much easier and he has a great time. When he gets home, back to his job at his family’s women’s clothing store, and his real friends –well he can’t quite be Mad Max. Who can he be? I loved this book! 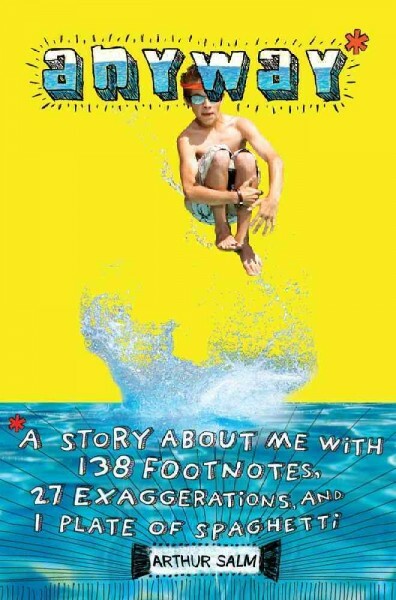 The author did an amazing job capturing that hazy area between being a child and being a tween. Max is slowly discovering who he is, and it’s a great kid who is fun, interesting, and has heart. The quirky inclusion of footnotes make a great example for an “intrusive narrator”, which was fun. I also enjoyed the flow of the story –memories mixed with interesting tidbits and real life events. Very well written. Students will relate to Max, but also be entertained –and might just learn something accidently. MS–ESSENTIAL Reviewer: Stephanie School Librarian & Author. A series of short creepy stories. Most of them end in some macabre or twisted way. For example, a bully gets his just desserts when his victim comes up with a twisted plot to get revenge. After being forced to buy and give him soda after soda, the boy gives the bully his extra sticky old Caramel/toffee –which sticks his mouth closed. On the next ride they go on –it fizzes up and has no place to go. Ends up pretty violent. I hated this book. I don’t mind a few twilight zone endings but most of this was gross, stupid, or just plain horrifying. Well, I know that sounds like the perfect recipe for students –but this book didn’t have heart. Part of what makes stories really scary and creepy is bonding a bit with the characters first. These stories don’t provide that and are not well written -just cold and angular. See the Deadtime Stories series if you want some better supernatural and/or scary stories. ELEMENTARY–NOT RECOMMENDED Reviewer: Stephanie School Librarian & Author. Katie is shocked when she finds out her former friend Callie (and her snobby club) are going to enter the school fundraiser contest with a cupcake stand. Everyone knows that Katies and her friends are the Cupcake Club –experts at what they do. Now the girls must come up with something extra creative to stand out. Katie is thrown into a situation where she must spend time with Callie –will the girls iron out their differences? I have reviewed a few of the books in this series now and I still really like it. I think the character development is fun and the story lines are simple but really entertaining. The only thing is that the girls are allegedly in middle school –but this reads like a book for 3rd -4th graders to me, and the characters act that age too -so keep that in mind. 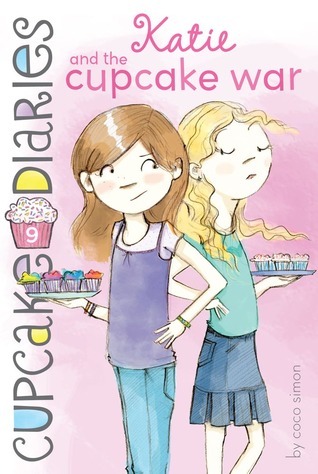 Cupcakes are still going strong in popularity –so this might be a fun series to add to your collection. ELEMENTARY–ADVISABLE Reviewer: Stephanie School Librarian & Author. Bean is too young to go to camp with her older sister Nancy. 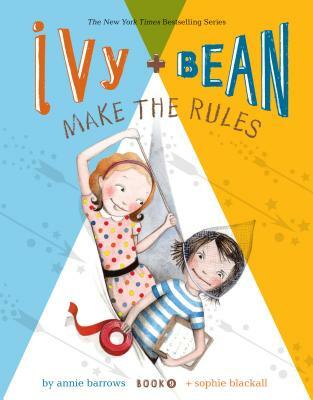 So Bean & Ivy decide to make their own camp, at the same park, with similar activities. They set up a tent and eventually their creative antics get the attention of other kids at the park. Camp Flaming Arrow causes mischief galore –from invading the park as zombies to tap dancing so loud on a tin bucket that Bean’s mom can hear all the way from home! This was a fantastic book! I know that this series is wildly popular with the students but this was my first time reading. The characters are memorable, quirky, and well written. The story was constantly surprising me with its creativity and fun. I was entertained and I just know that students will be too –maybe even inspired! Reviewer: Stephanie School Librarian & Author. Coven, Wanda and Illustrated by Burris, Priscilla Heidi Heckelbeck: Gets Glasses (Book 5) 128 pgs. Little Simon, 2012. $4.99. Heidi is envious when her friend at school, Lucy, gets glasses. So Heidi lies her way into a pair of her own. But they hurt to her eye's to wear and it causes her no end of trouble and accidental mischief. Especially when magic is involved. I was liking this book quite a bit until the magic part came in. I am a first time reader of this series so I didn’t know about it beforehand. Almost the whole book happens with no mention of magic, then when Heidi goes to an aunt's house and gets into some magical trouble -well suddenly Heidi is in a witch family! It was awkward as can be. It was like that part was written by a different author and the two didn't fit together. If the series is popular at your school –well this was a fun book and easy to read. I can’t say I would pick up the whole series based on this book though. 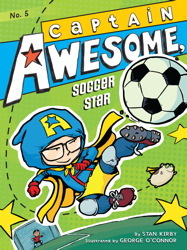 Captain Awesome (aka Eugene) and his best friend Nacho Cheese Man (aka Charlie) are excited to break the boredom of Fall by joining a soccer team. Eugene just knows he is going to be excellent, but finds out that its tougher than it looks. He isn’t allowed to play as Captain Awesome and must find another way to unlock his inner super powers. Everything and everyone is a possible nemesis to these superheroes. This book would not function well as a stand-alone, there are just too many characters, most of whom have comic book names in addition to their real ones. Add to that the boys favorite soccer stars and comic book hero’s and you have yourself too many character names to pack into a small book. Maybe if they were introduced in books 1-4, slowly, this book would make more sense to a first time reader of the series. Although this is not a graphic novel, the comic book theme and the artwork -give it that feel. I really liked this book and think that students will relate to Eugene’s imaginative outlook as the whole world becoming part of your internal story. EL – ADVISABLE Reviewer: Stephanie School Librarian & Author. Levine, Anna and Ksenia Topaz Jodie's Passover Adventure. 32 pgs. Kar-Ben Publishing, 2012. $14.00. PICTURE BOOK. Jodie is a budding archaeologist who loves to explore the sites in Israel, where she lives. 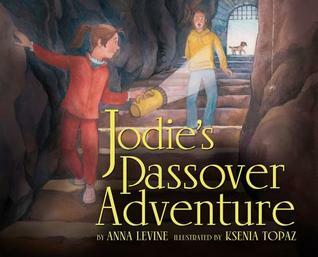 When her cousin Zach visits for Passover, she convinces him to come along on an adventure. Together they explore Hezekiah's Tunnel, a historical site beneath the city, trying to figure out why the pattern of the digging marks on the edges of the walls changes in the middle of the tunnel. Although the cover and title imply that this story will be a mystery, it feels as if the entire point is to tell the history of the tunnel, barely disguising the lesson in dialogue and exposition. May be best for children and adults who are interested in the culture or history of Israel, or who are building up a religion-focused collection. Note: while the book is billed as a stand-alone, it seems to reference a previous volume - something that those purchasing it may wish to take into account when placing orders. EL - OPTIONAL. Reviewed by: Caryn. 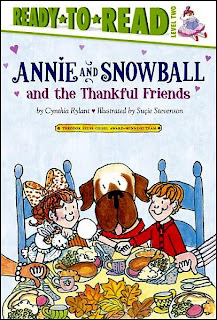 Rylant, Cynthia and Suçie Stevenson Annie and Snowball and the Thankful Friends. 40 pgs. Simon Spotlight, 2011. $3.99. 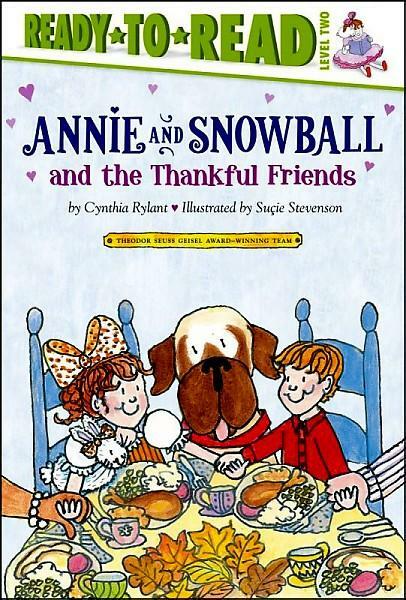 Content: G.
Annie and her father have just moved to a new town, and while they have a huge table to serve a Thanksgiving feast, they don't know many people to invite. Since Annie wants a big dinner, she enlists the help of her cousin Henry. Together they come up with a list of people to invite, but they're one short. When a surprise guest joins them at the very last minute, though, their dinner is complete. A cute, easy-to-read early chapter book with engaging characters and enough plot to keep children reading - and wondering who will fill that last chair. Colorful illustrations and some humorous elements add to the story and help it to become a year-round tale. 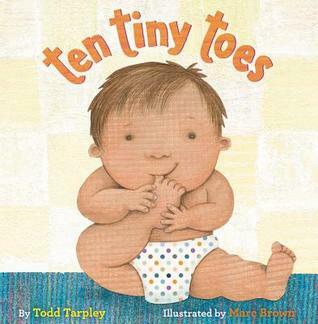 Tarpley, Todd and Marc Brown Ten Tiny Toes. 32 pgs. Little, Brown and Company, 2012. $16.99. PICTURE BOOK. Follows little babies and their ten tiny toes as they grow up from kissable newborns, to toddlers, to children who can ride bikes and skate, to parents themselves. I admit it - this one made me tear up the first few times I read it aloud to my toddler, and she enjoys seeing what all the different babies are doing. 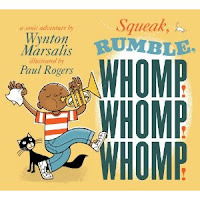 The collage-like illustrations are colorful and lively, and the rhyming text has a nice rhythm, which is only occasionally thrown off by the awkward wording used to achieve said rhymes and rhythm. 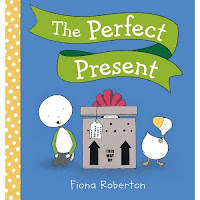 Seems geared more toward sentimental adults than practical children, but still a lovely bedtime story and one that can open up a discussion about babyhood, growing up, and the possibility that these children will one day become parents themselves. 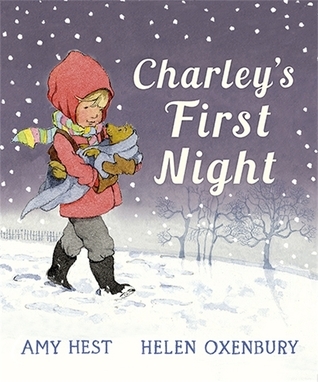 Hest, Amy and Helen Oxenbury Charley's First Night. 32 pgs. Candlewick, 2012. $15.99. PICTURE BOOK. Henry welcomes his new puppy to his house, happily showing Charley around, explaining everything to him, and agreeing to feed and walk him. But when Charley wakes up several times through the night, Henry can think of only one way to comfort him: curling up together in Henry's bed. Even if it's against the rules. The illustrations in this story are lovely and engaging, bringing life into the world of Henry and Charley's first night together. 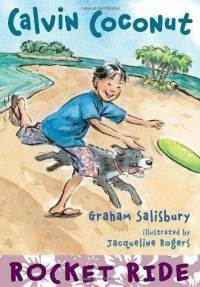 The story itself is sweet as well, and many children will enjoy being immersed in a tale of a boy with his new puppy, despite the rather abrupt ending. (What are the consequences for Henry bringing Charley into his bed? Are there any?) While the lengthy sentences have a good cadence, they are often unwieldy as well, and they may cause difficulties for new and struggling readers. The wordiness and repetitive sentence structure also make the book longer than it needs to be, giving it more of a child's voice but also slowing the pacing quite a bit. Morris, Gerald. The Adventures of Sir Balin the Ill-Fated, illustrated by Aaron Renier. 94 pgs. Houghton Mifflin Books for Children, 2012. $14.99. Content: G. Author Gerald Morris in his series The Knight’s Tales retells the stories of legendary knights in a lighthearted and charming way for young children who are just getting introduced to chapter books (his series Squire’s Tales is great for older children). The day of Sir Balin’s christening, an Old Woman from the Mountain comes to his home and gives a prophecy of his life. Balin will be known as the noblest knight in England, but he shall be followed by misfortune, strike a Dolorous Stroke, and cause the downfall of two kingdoms in one day. Balin grows to adulthood and believes in his ill fate and everything goes wrong. Finally he stops believing in the prophecy, meets a questing lady, and battles to the death (not really) with an unknown knight. Morris’s message is clear: you can be whoever you want to be, no matter what anyone says. The ink illustrations by Aaron Renier are detailed and action-packed without being too scary. A great book for young boys interested in knights and young ladies interested in questing. EL – ADVISABLE. Samantha Hastings, MA, MLS. Rodkey, Geoff. Deadweather and Sunrise: The Chronicles of Egg, book 1, 296 pgs. G. P. Putnam’s Sons (Penguin), 2012. $16.99. Sexual Content: G; Language: G (2 swears and a couple of made up ones); Violence: PG. If it isn’t bad enough to have a name like Egbert, thirteen-year-old Egg is stuck with the two meanest siblings ever: Adonis and Venus. His mother is dead and is father owns a fruit plantation on Deadweather Island, a desolate place full of pirates. They go on a trip to the island of Sunrise and his dad makes a secret appointment with a lawyer. After the whole family meets the wealthy Mr. Pembroke and his daughter Millicent, who takes them to his mansion and gives them a ride on his balloon. Egg leaves the balloon the last minute and the family flies away and is lost. Egg stays with the Pembroke’s and learns that there is something sinister behind their kindness—Pembroke is looking for a treasure. Someone tries to throw Egg off a cliff, so he stows away on a ship only to be caught by pirates. His adventures continue with a one-handed cabin boy and none other than Millicent. Their courage and cunning will be put to the test to save not only their lives but the treasure from Pembroke and pirates. This is a great adventure book for boys. The pirates are real enough to be interesting, but not too scary. There is plenty of fighting, but not too much blood. The plot has several twists and turns and Egg is an engaging narrator. EL, MS – ADVISABLE. Samantha Hastings, MA, MLS. Paulsen, Gary. Crush, 136 pgs. Wendy Lamb Books (Random House), 2012. $12.99. Sexual Content: G; Language: G; Violence: G.
Crush is a companion book to Liar, Liar and Flat Broke; however, you do not need to have read those titles to thoroughly enjoy this laugh-out-loud read. Kevin Spencer has a serious crush on Tina Zabinski, instead of just asking her out, he decides to take the scientific approach to love. His scientific test subjects are his unwitting family members and friends. He tries to create a romantic dinner for his parents and ends up starting a fire in the kitchen. His scientific conclusion: “there is no romance in this house.” Kevin’s next step is to set people up and observe the chemical reaction. One of his test subjects is named Goober, need I say more? Kevin also manages to send mixed-messages to his almost friend Katie and she thinks they are on a date. In a charming and satisfying conclusion Kevin’s love life comes untangled. 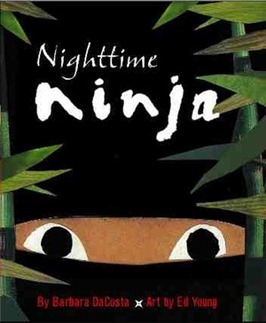 This is a great read for boys and reluctant readers. Paulsen’s first person narrative is humorous, quickly paced, and not at all mushy. EL, MS – ESSENTIAL. Samantha, Public Librarian. Cousins, Lucy Za-za's Baby Brother. 32 pgs. Candlewick Press, 2012 (reprint). $6.99. PICTURE BOOK. 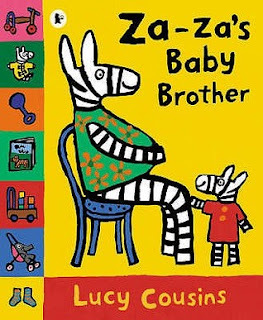 When Za-za's mommy gives birth to his little brother, his entire world is changed - and not for the better. Not only does Za-Za find himself playing alone while listening to all his neighbors coo over the new baby, but his parents don't have any time or energy for him, and he has to wait for every snack or scrap of attention until his parents are done tending to his brother. When Za-Za asks for just one little hug, his mother is too busy doing baby-related chores yet again, so she suggests that he hug the baby instead. He happily does so, and suddenly decides that - wow! - not only is his baby brother nice, but he's also fun to play with. From then on they are inseparable. The resolution, coming after so much (understandable!) resentment and being pushed aside, is abrupt, unbelievable, and very uncharacteristic of the brothers. In truth, it's hard to believe that one hug would change any child's opinion of a baby brother who has been so coddled while he himself has been completely ignored. In addition, the story paints a very negative picture of sibling-hood and is choppy, with a very unclear timeline. Pre-K, EL (K-3) - NOT RECOMMENDED. Reviewed by: Caryn. 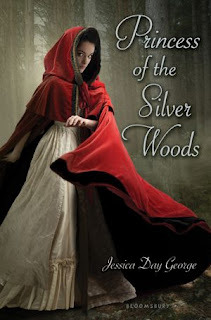 George, Jessica Day Princess of the Silver Woods, 334 p. Bloomsbury, 2012. $17. Language: PG (3 swears, 0 ‘f’), Violence: PG; Mature Content: G.
It’s been ten years since Galen helped the twelve dancing sisters defeat the King Under Stone and Princess Petunia is off to visit the Grand Duchess Volenskaya and her gorgeous son, Dmitri. When she is waylaid and kidnapped by bandits in the woods, however, she finds Oliver, a displaced earl, who also tugs at her heart. None of the princesses know that the Princes Under Stone and their new King have been scheming and plotting and gathering minions for the last ten years in order to recapture the princesses and force them to wed in their dark palace – and some of those minions are very close to Petunia. With three handsome men vying for her hand, Petunia will need her sisters, their human princes, a lot of magic and massive amounts of courage in order to defeat their enemies and be free of the Under Stone forever. Ms. George has totally redeemed herself in my eyes with the third in the Dancing Princesses series. The characters and their situations ring true to the fairy tale setting, increasing the danger from the first novel and weaving in just bits of other tales. You could really eliminate the second book in the series and just go straight to this one and be very satisfied. Your girls who love romance, danger and a bit of fairy dust will be enchanted. 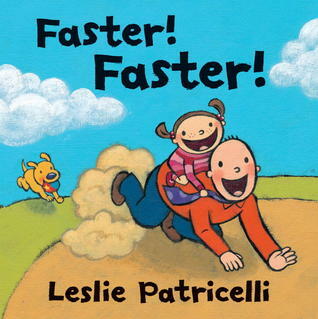 Patricelli, Leslie Faster! Faster! 32 pgs. Candlewick Press, 2012. $15.99. PICTURE BOOK. While visiting the park one day, a little girl climbs up on her father's back and challenges him to go "Faster! Faster!" How fast can daddy crawl with her riding along? As fast as a dog? An ostrich? A cheetah? This cute picture book has many nice touches, including foreshadowing to the next animal and a tired-daddy illustration toward the end that's sure to make children laugh. A nice follow-up to Higher! Higher! 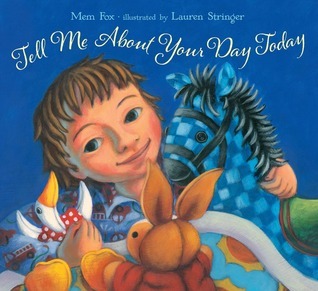 Fox, Mem and Lauren Stringer Tell Me About Your Day Today. 40 pgs. Beach Lane Books, 2012. $17.99. PICTURE BOOK. There once was a boy who loved bedtime. His favorite part? Discussing the day's events with his three favorite stuffed animals. In turn, each one tells about the adventures of the day, and how "the whole wild thing turned out okay." While they all address a similar event - a thunderstorm and its aftermath - the various retellings show how perspective can change a story. While the words in this book are simple, the cadence is phenomenal and very satisfying to read aloud. Although each of the four encounters difficulties throughout the day, at the end everything is fine, and they are happy, safe, comfortable, and loved. It's a nice message to leave children with before bed. The story also models good listening, as the goose, the bunny, the rocking horse, and the boy all wait politely for each to tell the story of the day, taking turns in a very respectful way. This is quickly becoming one of my new favorite read-alouds. 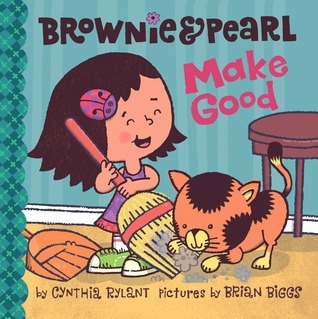 Rylant, Cynthia and Brian Diggs Brownie & Pearl Make Good. 24 pgs. Beach Lane Books, 2012. $13.99. PICTURE BOOK. While running too fast through the house, Brownie and Pearl accidentally break Brownie's mom's radio. Since they can't replace it, they have to "make good" by doing some tidying. But it's not until they do something spontaneously cute and joyful that Brownie's mom truly forgives them. This cute story addresses the idea of repairing the damage when you make a mistake, even if you can't put everything back the way it used to be. The colorful pictures, true-to-life little girl, and adorable kitty make this my pre-schooler's new favorite book. 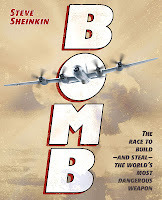 This book is the history of the Atomic bomb. From scientists –like Albert Einstein, to spies –like Harry Gold, this book is choked full of historical figures and information. I am a big history buff, so I was excited to read this detailed story. But it was a drag to read, just page after page of text, and more and more hard to remember ‘characters’. Hardly any photographs and no text definition –like bolds or information blurbs, which made it boring for me and even at times, hard to follow. This makes it totally not a user friendly for students. On top of that, it skips around in time and place, so it would be confusing for a student researcher –who would need to read this start to finish to fully understand it –even to extract information. 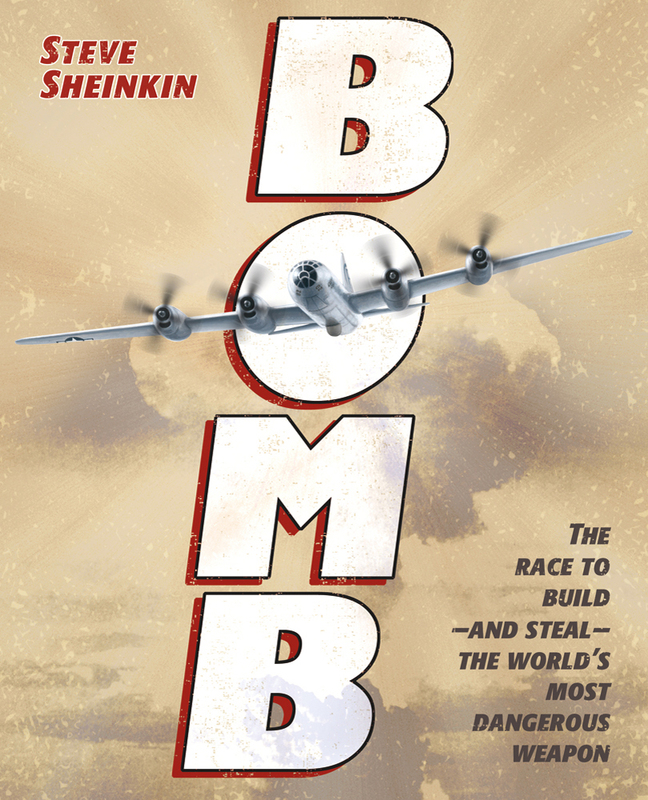 I realize this book was highly rated by all the popular book reviews sites for librarians, and is even up for an award, and I am sure it illuminates a previously untold story –but I don’t recommend it for a school library. HS –NOT RECOMMENED Reviewer: Stephanie School Librarian & Author. Mrs. Brisbane’s class has substitute, and Humphrey is worried. 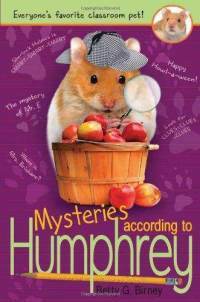 Since the class in the middle of learning about Sherlock Holmes, Humphrey knows that it will take gathering clues to figure out where Mrs. Brisbane is and when she is coming back. In the meantime he helps the students, critiques the subs teaching style, and enjoys his snacks. There is only one thing I didn’t like about this adorable book in a popular series –is that I think the class would have known what happened to their teacher (especially since it’s pretty trivial –not like a major disease or life threatening thing). The author has done a fantastic job creating a multifaceted hamster character. Even the Humphries way of naming for the students in the class is creative and quirky. Students have been eager for this newest book and it’s a great read. When Calvin's dad comes to town for the first time in years, Calvin is nervous. Will things be too different? Will his new step-mother be nice? To complicate things, his dad is a popular singer, and gives Calvin tickets to his concert. Tito the bully is being more than insistent about getting a ticket, but Calvin sort of wants to give the ticket to Shayla, a girl who has crush on him. As a huge fan of this series, I of course, really liked this book. But I don’t think it would function great as a stand alone or a first read in the series. It is a must-have if you already have any of the other books. My favorite thing about these books is that the characters and experiences are very genuine. In this book, Calvin deals with a bully in a totally normal way -he isn’t too wimpy but isn’t too brave either. Ed Bagley is not having great luck. He is embarrassed in front of his crush, electrocuted, and finally hit by a car. But that’s not the end. He wakes up as a stinky, rotten, worm-infested Zombie. Turns out his whole town is full of the undead, and he finds a new werewolf friend. 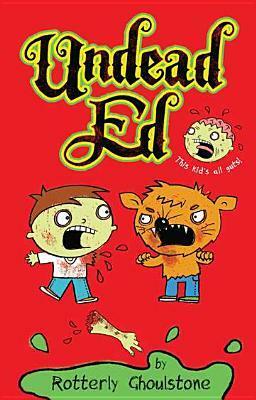 When his rotten arm takes off on its own, it becomes an evil entity –Ed must embrace his new self and bravely face his arm. I am just going to say it. I think kids will really like this book. I would liken this book to the candy bars for sale at grocery checkout. Does it belong in a school library? Only if you need to employ some pure entertainment shelf fillers. It’s an easy read despite the length. It has a larger font size, with a simple plot and easy to understand words. ELEMENTARY–OPTIONAL Reviewer: Stephanie School Librarian & Author. 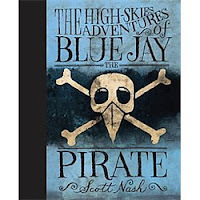 Birds are the pirates in this book, and their ship sails in the sky. Captain Blue Jay obtains a rare egg. It hatches, a bird that will change the course of their adventures. On the ground Sparrows are just trying their best to get by. The two worlds collide when the pirates must take refuge with the peaceful, but bullied sparrows. Together they must face the Crows that plague their land. A bit of help from a mole and their hatch-ling, might just even the odds. Honestly, I am way over the animal adventures (like Redwall, I think I read myself half to death on that series when I was growing up). But this book really surprised me. I found myself really liking the characters and the story. There are some really nice illustrations all throughout. 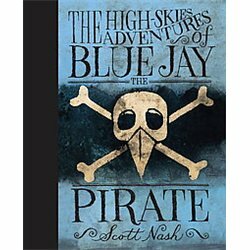 I think students will enjoy this pirate story! Loftin, Nikki The Sinister Sweetness of Splendid Academy 228 pgs. Razorbill, 2012. $11.55. 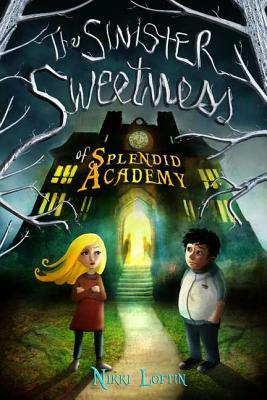 Lorelei and her brother are going to a new school –The Splendid Academy, which is almost too good to be true. Lots of the best food, lax rules, lax assignments, and an amazing playground. But something is wrong, and it takes her new friend Andrew and the kitchen staff to help her see that something sinister is going on. Something that requires all the students to be fattened up! So this was decent read, but it could have been 100 pages shorter, much of it just repetitive. I am still really sick of the evil headmasters (orphanage, school, you name it), and even worse –the creative tortures. There is also a personal tragedy element that just doesn't come together in a way that makes sense at all. But I think students will dig the mystery, magic, and even the sweets. If you need something to fill your shelves, you could do worse than this. 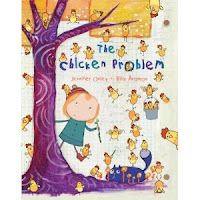 Right before their pie picnic, Peg and her Car accidently let out 100 chickens! How will they catch them? EL –OPTIONAL Reviewer: Stephanie School Librarian & Author. 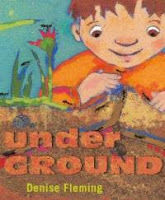 A simple word picture book of what’s happening underground. Like yellow jackets building nests and rabbits sleeping. Illustrations are bold and bright collage style artwork. Includes a picture creature identification glossary. This was a fun book. I really liked that pre-K students could enjoy the simple words and the story, while older students could be asked to discover the many things going on. Students will be drawn to the bright cover, the bugs, and the dirt! Pre-K, EL – ADVISABLE Reviewer: Stephanie School Librarian & Author. 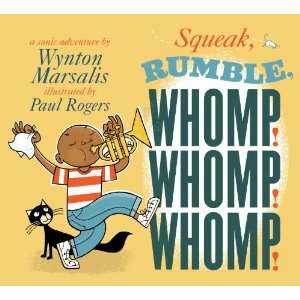 A boy explores the sounds of his neighborhood –from door squeaks, to mice eeeks to saxophone speaks. Big, bright, colorful, yet simple illustrations to accompany. EL (K-3)– ESSENTIAL Reviewer: Stephanie School Librarian & Author. 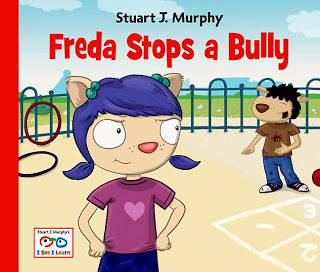 Freda learns how to deal with bullies one step at a time, as their teasing about her new shoes escalates. Includes tactics given in the form of advice from Freda’s mom and teacher. This was an excellent book. The illustrations are bright and clear. The story is well told, with very clear tips on how to deal with a bully. I like that the advice is given by supportive adults, not just “provided” by the book itself. Very useful as a teaching tool. EL, ELEMENTARY– ADVISABLE Reviewer: Stephanie School Librarian & Author. Max and Mo are cozy as two little rodents can be. But when they see the students playing outside and making a snowman, they want to do the same. But since it’s too cold, they decide to get creative in the art room. Includes instructions for how to create your own snowman inside too. Of course this is a cute book, and cute series. 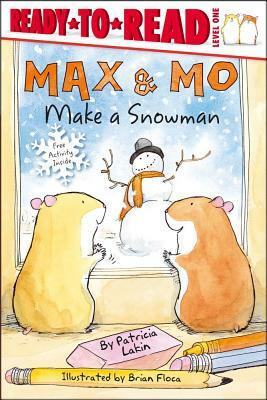 Add it to your collection if you keep up on Max and Mo books, and need some great level 1 early readers. Puffins breed and raise their chicks on the Westman Islands, Iceland. Because of the nearby towns and their lights on at night, the fledglings get confused and fly into town. They can’t take off again, and must have help. That is where their children of the island come in. 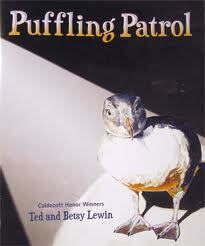 They look for the lost fledglings, help take care of them, and get them out to sea where they belong. The washed out water color illustrations in this book were flat out drab. While there is set that truly appreciate the beauty of watercolor work –it’s certainly not today’s students. I don’t think that they will pick this up willingly. That being said, the story is interesting, well told, and includes just the right amount of information about the birds, their habitat, and their current conditions. Could be used in conjunction with a lesson on how students can help wildlife, birds & habitats, and even environmental conditions in this changing world. 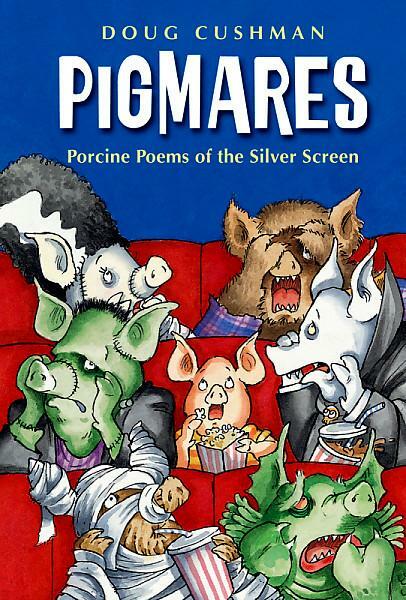 All the classics of horror are retold with pigs as the main characters. Each are presented in a single page poem format with accompanying illustrations. This is just awful. I was hoping it would be silly and funny enough for this students to laugh at some goofy poetry, but there are a couple disconnects here. First is that most kids haven’t seen these “classics”, although a few characters are universal –most aren't Second the language is a bit above those students young enough to see some humor in the whole pig thing. I also just thought the poems and the illustrations were boring and totally not funny. 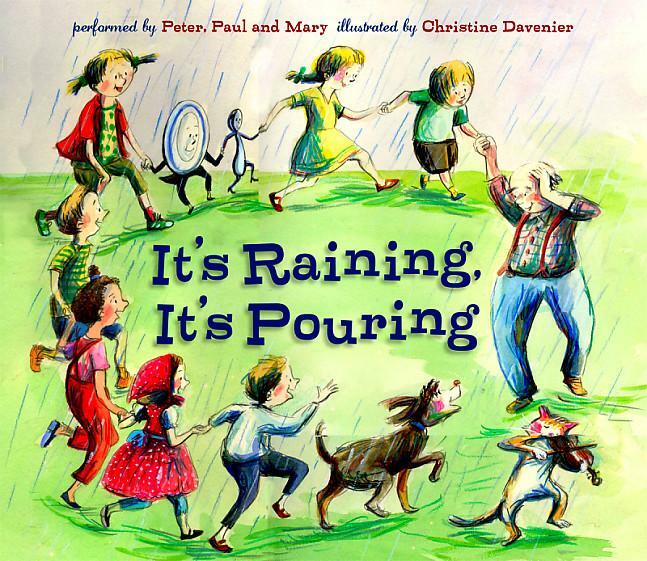 Peter, Paul and Mary; illustrated by Christine Davenier It's Raining, It's Pouring. 32 pgs. Charlesbridge, 2012. $17.95. PICTURE BOOK. 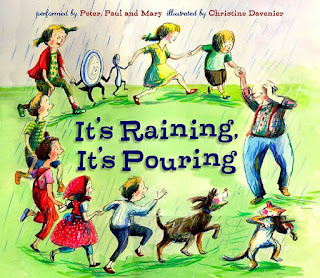 A picture book rendition of the lyrics to Peter, Paul and Mary's 1962 folk song by the same title. While some songs lend themselves to picture book format, this one does not. The lyrics are random and disorganized, something that comes across in the song when performed by different singers and with different instruments in the background, but does not work when reading the lyrics straight as in book format. Even the accompanying CD and colorful illustrations are not enough to round this out as a story. Might make a good gift for an adult who is nostalgic for 1960s folk music, but unlikely to reach a wide youth audience. Includes CD with this song and two others. EL (K-3) - NOT RECOMMENDED. Reviewed by: Caryn. Gray is a big cartilage shark pup who lets his hunger get the best of him. This ends up getting Gray banished from his shiver. Lost and wandering, he tries to find new friends and a support system. Gray’s adventure is just beginning as he finds himself and his destiny. Shark kind’s future rests on Gray and his decision. The characters are underdeveloped and the plot is sketch and the ending doesn’t really resolve the main issues that set the plot. 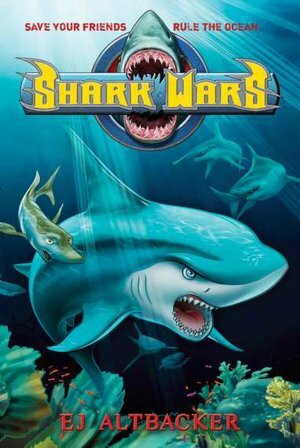 Shark fans, however, will enjoy the adventure and fishy relationhips throughout this book. EL (4-6). OPTIONAL. Reviewer: Jessica Moody, Library Media Specialist, Olympus Jr. High. 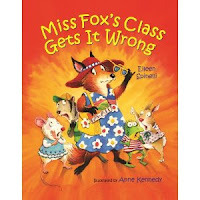 Miss Fox is a much loved teacher, but when her class gets it in their heads that she is in trouble, well they really get it wrong. It all starts when they spot her with a police officer, and the clues just pile up from there. They imagine the worst -her behind bars. Will they be able to save her, from their overactive imaginations? This is a cute story, with a good lesson about not jumping to conclusions. The artwork is kind of dated looking for my taste (and I know that for a fact with the students), but the cover is so brightly colored that I would be willing to give it chance in the library. EL -ADVISABLE Reviewer: Stephanie School Librarian & Author. This is a follow up to the book Wanted a Perfect Pet. Spot the duck and Henry are the best of friends. But when Henry ignores Spot’s perfect birthday present, but one that is much more exciting, well Spot is upset. He runs away, feeling sorry for himself, and learns a lesson about true friendship. I really liked both the first book and this follow up. They are simple, adorable, and full of heart. Students will love the clear images and clear message. Spot the duck is a great character! 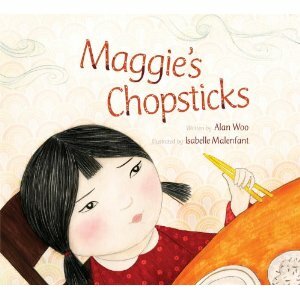 Maggie is trying to learn everyone else’s techniques for holding chopsticks. But it’s just not working out, and she realizes that her own way might not be perfect, but it’s just right for her. This is a cute culturally relevant story with a wonderful message. There are lots of sounds, creative descriptions, movements, foods, and colors. A rich cultural backdrop for learning a subtly presented life lesson. Great book! 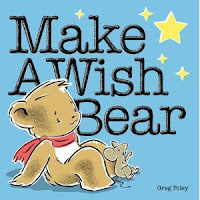 Bear isn’t sure how to make his wish on a star come true, but his friends all sure of advice. Bear tries them all, before realizing his wish has already come true –to spend time with all his friends. Adorable artwork, cute and simple message about friendship. Can’t go wrong here. Students would have fun trying to act out all the advice (like stand on one foot while holding your breathe!). Through all obstacles a ninja sneaks through a house at night. Climbing, jumping, and hiding. All to get to a hard to find object. Will his mom catch him eating the ice cream? Awesome collage style artwork with a quiet sneaky buildup to a dramatic ending! This is almost a pure picture book, students would have fun making up more story to go along with it. Not to mention the popularity of ninjas! EL -ESSENTIAL Reviewer: Stephanie School Librarian & Author. The title says it all. A cute simple clothesline with an outfit attached, accessories on the ground, and a simple short verse with hints. The next pages reveal the career person at work. Examples are cook and farmer. Simple bright and colorful. I really liked that they didn't use traditional gender stereotypes. It was clear and to the point. 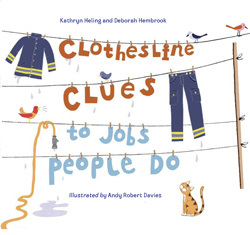 Children will love the guessing game part, perfect for a unit on jobs! For all her 16 years Sonia is known for her protective powers. Despite the faith of the villagers, she knows she is just a normal person. When given the opportunity to have a city job, she takes the chance –even if it means leaving behind her impetuous brother and a very special friend. Her new life is restrictive, but she when she finds out her brother has gone missing, Sonia will stop at nothing to find him. I am pretty sure the intent of this slow moving story is for Sonia to build some confidence and find her own magic. But it was just a flop for me. I couldn’t figure out if there was a real cultural basis or it was just made up. The motivations for the majority of the characters were murky at best. For example Sonia’s brother - he wanted to earn more money –but his timing made no sense. If he had waited just a few months, Sonia could have sent him money for a car –no need to run away on foot through bandit country! Confused. The whole book sort of orbits around her brother really, Sonia takes a boring second –I don’t see her evolving much as a character. If there was more folklore or culture to this book, perhaps tying it to an actual real world culture –I might have found something to hold onto, but this story just wasn’t enough. HS -ADVISABLE Reviewer: Stephanie School Librarian & Author.